Apparently, LinkedIn's cofounder wants to add "Trump instigator" to his resume. 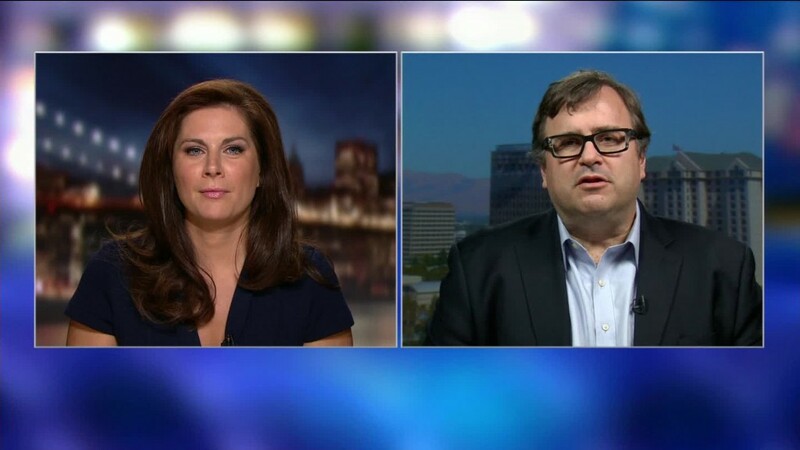 Reid Hoffman, the cofounder and executive chairman of LinkedIn (LNKD), pledged on Monday to donate up to $5 million to veterans organizations if Donald Trump releases his tax returns before the final presidential debate. The pledge follows a crowdfunding campaign launched late last week by Peter Kiernan, a Marine, to raise $1 million and donate the money to ten veterans group if Trump releases his tax returns by October 19. "Trump claims to love veterans, and so we're asking him to put his money where his mouth is," Kiernan wrote on the crowfunding page. "These ten groups all support causes that I personally believe in and best identify with the current generation of millennial veterans." Donors will only get charged if Trump releases his taxes, Kiernan added. As of publication, the campaign had raised $17,000. Hoffman says he will match all donations five-fold up to that $1 million mark, or as much as $5 million. As Hoffman points out, that is the same amount Trump offered to donate in 2012 if President Obama released his college transcripts and passport applications. "Taking Trump's own 2012 offer to President Obama into account, I'd like to assist Kiernan in his campaign," Hoffman wrote in a Medium post. "The American people deserve to know what's on Trump's tax returns," he added. "And Trump must show that he truly embraces accountability and transparency, and understands what it means to work on behalf of the public interest." Hoffman isn't the first business figure to pressure Trump to release his tax returns. Warren Buffett challenged Trump last month to release his returns. So far, no luck. Trump has claimed that he is being audited and therefore cannot reveal his returns, a fact that many experts disagree with. 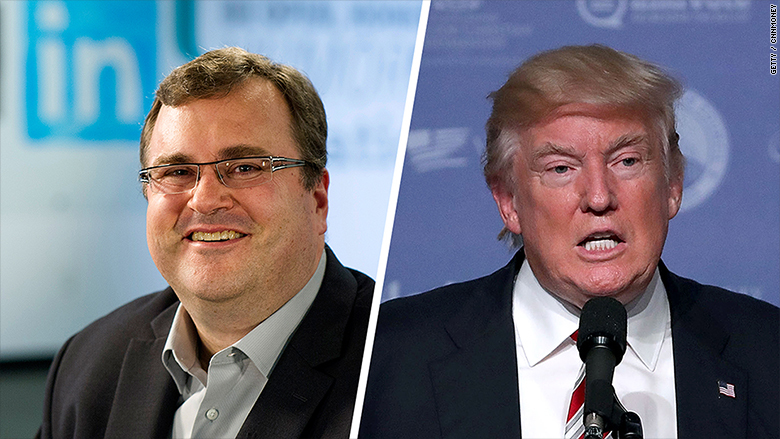 Hoffman, who got rich launching LinkedIn and richer still by selling it to Microsoft earlier this year, is just one of several Silicon Valley billionaires applying financial pressure to the Republican presidential nominee. Dustin Moskovitz, cofounder of Facebook (FB), recently committed $20 million to help beat Trump, slamming his campaign as "one built on fear and hostility." Hoffman, along with billionaires Sean Parker (of Napster fame) and Marc Benioff (Salesforce (CRM) CEO), have each contributed or raised at least $100,000 for Hillary Clinton's presidential bid, according to her campaign's list of bundlers. Hoffman was one of dozens of business executives to publicly endorse Clinton for president in June. "Amongst the key qualities of any serious candidate for President of the United States is a keen understanding of the global economy, and the ideas and will to implement policies at home that improve the livelihood of all Americans," Hoffman said at the time. "As an experienced entrepreneur and business person, I can say that Hillary is the candidate who best ensures the future of American prosperity." When asked at TechCrunch Disrupt on Tuesday whether the idea of a Trump presidency frightens him, Hoffman didn't mince words. "I'd say at the moment I'm in denial," he said. "A candidate who has demonstrated no public service that I'm aware of ... is terrifying for U.S. and foreign relations." CNNMoney's Heather Kelly contributed reporting.